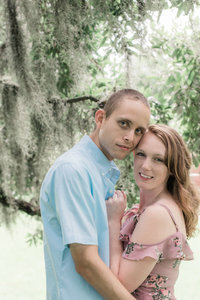 Take a look at our favorites from Ashley & Joseph’s Oak Grove Lake Park engagement session!! It may have been a bit gloomy and overcast, but we are so thankful it did not rain! Rescheduling was not ideal since Ashley was in the process of moving to Raleigh with Joseph. Ashley is a teacher and Joseph is finishing his nursing degree, so both of their schedules are packed! It was so nice having this time to get to know them better. Ashley is a huge Disney Fan, especially Rapunzel! Wait until you see her ring!! Watching movies is one of their favorite things to do together, especially Marvel films. Their Founder’s Inn Wedding is this Saturday!! We are so excited to see them again and capture their special day in Virginia Beach!